Oramfe, Sangó, Jakuta, Hevioso are all spirits associated with thunder. They are all red in colour and they all have relationships to politics, water and women. The form of thunderous manifestation varies slightly. Oramfe seem to be more serene and Januslike, while both Jakuta and Hevioso seem to be less boastful than the Oyo representation of the thunder spirit, Sangó. In Ilé Ife, Oramfe is important in the Odun Ose festival dedicated to Omitoto, or the deified spirit of cool water. Central in the rituals is the apparition of Orisa Ito,which manifests as the mudfish. This fish who lives in two kingdoms at the same time, in water and on land replicates a deed secret on Sangós complex nature. The same bi-morphic element is found in the birds used to represents the spirit of thunder, the nightjar and the okin, or flycatcher. Both avian species suggest the importance of both anomaly and change in the animal world as a reference to ritual and political primacy. And here we encounter the complex field of Sango and mundane politics. 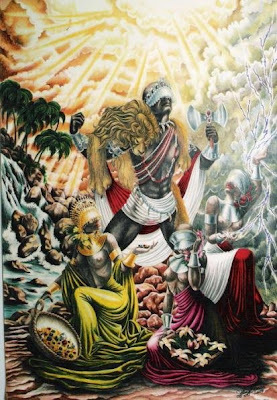 For Oramfe, the spirit of thunder in Ile Ife the cult is closely intertwined with Obatala, with the principles of calmness and freshness. In Oyo, Sangó, is first and foremost a Balogun, a war lord, which is only natural as Oyo from the founding of the 16 Yoruba kingdoms were originally the state assigned to take particular care of war and defense. Hevioso takes more the shape of a king amidst his comrades and Jakuta takes the form of a feline hunter. Oramfe is at times represented as a ram headed figure holding an ax. A form that was given to Alexander the Great as ‘son of Jupiter’, and a image we find replicated in Picatrix for creating talismans capturing the dignity of Mars (in particular when Mars is in Capricorn). This form reminds of Jakuta (He who throws stones), an Orisa seen as the guardian of social morality and political fairness and justice, just like Oramfe. Sangó somehow represents the two blades of his ax and personifies how the blade can turn upon its owner by arrogance, pride and delusions of grandeur. In Sango we find several mysteries explained that is subject for a vast amount of misunderstandings and profane perspectives. One of many is why the cult of Ifá and Orisa is using stones (otan). There is a Yoruba saying that tells about this metamorphosis: wón dota, ‘to become stone’. This is related to the passing on after the journey as human beings and our return. The idea of becoming a stone is a reference to be deified. Some Yoruba sages tells us that when heroes dies they are hurled towards the center of the earth and sprouts up through the surface as a stone and return along a golden ladder to Orun (the celestial abode). The stone becomes then the physical embodiment of a particular force. The stone as the mountain speaks of ancestry and wisdom. It is in the mountains, with the wind fondling our mind and heart that the straight way towards source is opened. Sango is most famous in the form he took as a former Alaafin (king) of Oyo, where he is depicted as a ruthless and tyrannical king ruling his people with fear and controlling his kingdom in ways not much different from, let’s say, Idi Amin. With the aid of his wives, especially Oya, he realized his brutal ways and filled with regret and humbleness he went to the awun tree (some say Obi tree) and hung himself. This act reflects the original customs concerning kingship. The society of women (Iyami) are those who possess the power to crown a king – and they can also take the crown back and demand the king’s death, which in these cases means to demand that the king commits suicide. This principle is manifested in the odu Obara, probably an elision of Oba Ara, ‘king of thunder’ and represents the personal strength as it takes the form of will power. The odu is warning against entertaining states of suspense and insecurity as this tend to provoke paranoid states which in turn teases enemies to take shape. In this odu we are reminded that we always need others, we need balance. It is in this odu we find the proverb: Otunwesin Osinwetun, ‘the right hand washes the left, the left hand washes the right’. The typical materials for ebo here is pigeon, water, shea-butter, cotton, ogi ori (cloves). Everything that is related to maintaining a calm and tranquil mind so good decisions can be made. In Sango we can learn much. We see what excess of fire can do when reflected in a self centered Will combined with the political power to execute it. In Sango we find the lesson of humbleness and the secrets of divine presence upon earth in the form of otan (stones) and ancestry. He is a king who ideally dresses in female clothes, not because of any modern funny idea of profane explanations for a man dressing the apron of a woman. No, he dresses as a woman to give homage to the source of power, woman is the crown of kingship and a kind who has no support from women is no king. It is a reference to men always to recognize that we are what we are because of odu (the womb), that the wisdom of the world belongs to woman. Sango teaches us that consequences of deviating from what is good, true and just. In a way he is a contrast to older deities of thunder, such as Jakuta and Hevioso who are stern upholders of political order, perhaps more like Alexander the Great and Julius Cesar. Both these famous leaders represent the clarity of vision aided by a good mind in the guise of good and wise teachers and advisors.